Preferred Habitat: Wetlands and associated bottomlands. Seasonal Occurrence: Uncommon spring through fall. Most common in the fall. Breeds in our area. Profile by Glenn Olsen: Without a doubt the most stunningly beautiful and graceful raptor in our skies is the Swallow-tailed Kite. The shape of this bird and the color pattern make it easy to identify but more importantly, make it unforgettable. Most often observed flying, the visual image of the shape is that of long pointed wings typical of kites, and a long, deeply forked tail that looks like an open pair of scissors. The color pattern is an all white under body, white axillaries, and white underwing coverts contrasted against a blue-black tail and blue-black primaries and trailing edge of the secondaries. This species forages for insects on the wing; gliding gracefully, turning majestically diving swiftly catching insects in its talons and eating in flight. During these feeding maneuvers you' ll have the opportunity to see that the upper body and wings are all blue-black and only the head is a snow white. What a truly stunning sight! You may also see these birds deftly extracting insects, lizards, frogs, etc from trees, shrubs or off the ground. Insects, reptiles, and amphibians compose most of their diet. This kite may be seen in conjunction with Mississippi Kites or Ospreys that also frequent parts of the same habitat. 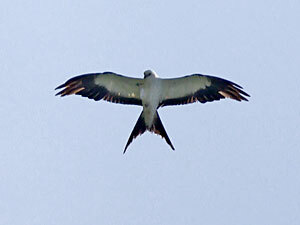 When compared to the Mississippi Kite, the Swallow-tailed Kite looks huge. It is noticeably smaller than the osprey, evidenced primarily in the shape of the wings. This Neotropical migrant spends the months of our winter as far south as South America. They begin arriving in our area in March. The historical breeding range extended up the Mississippi River as far north as Minnesota. The current breeding range appears to be limited to the states bordering the Gulf, including east Texas and Georgia and South Carolina on the Atlantic coast. The preferred habitat seems to be swamps, river bottomlands, and pine fringes along flood plains. A.C. Bent reports that nests are located near the tops of tall pines, cottonwoods, sycamores, cypresses and a few others. Estimates range from 800 to 1,200 breeding pairs in North American with about 65% of these breeding in Florida. So this species is not common in our area. July through early October is a good time to observe this species during its fall migration southward. Areas around the Trinity River, the Wallisville Lake Project, and Anahuac National Wildlife Refuge are good places to look for this bird. I promise you, if you see one, you will not forget the sight and experience! !